Why would a non-bird photographer give a bird photography class. Good question. I do not think I have reached my federally approved level of humiliation this week. 1. I take bad bird photos. 2. I do not have the patience to take good bird photos. 3. I do not know what I am doing when a bird is in front of my lens. 4. I do not have the equipment to be a “real” bird photographer—in general, “real” bird photographers must have a lens that allows you to see ants on the moon. I know your next question: “Why are you doing this?” I lost a bet? Really, it all started when I was down in Galveston after a portrait session and I remembered that “birds of a feather” was our club’s assignment for October. So, with my mighty 70-300mm lens in hand, I set-out to capture the perfect bird photo. Here I wanted to play with the compression created by my massive 300mm of thundering glass. The bird was about 100 feet from me and the rigs in the background were about 600 yards. Yet, because of the compression, the two look like they are right next to each other. I think this effect adds interest to the photo. The image that is shown here only represents about 40% of the frame that I captured—a nice 600mm lens would have made the photo to be pretty much full frame and think about the compression and bokeh that I could have achieved. And just think, I could achieve this by merely forking over $10,300 for a Nikon 600 AF-S f/4G VR. Cheap at twice the price. I wonder how fast B&H can get it to me? Camera settings: Nikon D3, Nikon 70-300mm f/3.5-5.6 at shot at 300mm ISO 200, f/5.6 and 1/750th of a second. Lightroom 3—Set black and white points, added clarity and mid-tone contrast. Photoshop CS5—removed a few distracting elements within the photo and balanced the colors within the image. Nothing worse than a photographer with lens envy. Never thought you would go to the dark side of big lens. Hope JD slaps you back to senses. I would not classify this as a bird photo. You have too many manmade items in the photo. Bird photos should include on nature. 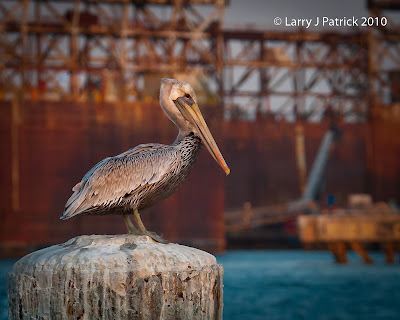 I like the way that the pelican stands out from the background because of the depth of field but I wished that the whole photo was somewhat brighter. You are right. You cannot photograph birds. Maybe I can actually provide some critique or comment that is helpful. You don't have all the gear you need to get this right in camera, as you noted. Given the focal length and aperture of that lens you can't get enough blur on the background. There are already enough bright areas to distract and areas that don't allow the subject to separate from the background. The landscape mode doesn't work as well here as portrait would, also removing some of the distracting elements on the right. A 500mm lens goes a long way to helping with that, but as you also noted it's an expensive proposition if you only shoot one every blue moon. You could help this photo by using a Better Beamer on an external flash to pop a little fill on it. Just like people, the eyes are usually most important to bring out. Again that involves a bracket and another piece of equipment. I like the colors throughout the photo, including the blue water. I like the detail on the pelican too. You might consider taking a little extra time and do a few things that will help. Crop to portrait mode. Perform a selection of the bird and increase the exposure enough to enable the eyes to be seen, or use selective dodging to bring the bird forward. Feather the selection before you step out of that layer. Make another selection around the background, but not the foreground pier the bird is perched on. Burn everything in to get more separation from the bird. Again, feather the selection before stepping out of the layer. I'm sending you the photos I've done for your review. They are just rough edits based on your small jpeg. Much said about this photo. But I think no one has remarked about the most important thing -- quality of light, and you have captured that very well. It's easy to suggest throwing money and gear at an image to improve an otherwise fine photo. If you had a 600 mm, you'd have people saying the image should show more environment. You can't win. Shoot what makes you happy and so be it. Larry, I have been thinking how could I respond but not anymore. Doug said it well! As for "You can't win"...I disagree. This can be a win - win! You buy the lens and I can use it! If you choose to use it I can be there to help you get up out of the sand and muck. :-) I do agree with shooting the light and what makes U happy. To me, a portrait crop would make the photo very static. The bird would have no room around it and I would remind Doug that the bird would be looking out of the frame, something that he seemed to have a problem with in an earlier photo. As to separation, I see plenty. The bird is easily visible from the background and that is all you want. Additional brightness on the bird might add to the separation but would it distract from the mood of the photo? I do think Steve is right, quality of light is what this one is about. Finally, because the background is soft and out of focus I do not find any distracting details in it. This is not a great bird photo, but I think Doug believes that his preferences are the gospel. Larry, a lot of your photos seem to be a little dark lately. Is this your intent? I'm glad my comments generated more comments. We all have our own opinions. I merely expressed an opinion of what could be done on one photo, neither right nor wrong. There is nothing wrong with a bird looking out of a photo as long as the edge of the frame doesn't act like you just cut off his beak. You should provide some room to look out on the side they are facing. On another note: It's a blog everyone, lighten up a little. Larry happens to be a friend of mine.